The Fox Tower is the ultimate entertainment destination at Foxwoods Resort Casino. A night in the hotel’s luxury rooms and suites prepares guests for a happy day of swimming at the 5,500 square foot resort pool or sampling gourmet Italian and Asian cuisine. Afternoons give way to unforgettable nights dancing at the hotel’s top-rated nightclub Shrine or playing the slot machines and live gaming tables at Centrale Fox Tower. A visit to The G Spa & Salon is the perfect cure for a long night out, with a restorative massage, facial or body treatment followed by a session in the sauna, whirlpool or steam room. Guests at The Fox Tower can choose from three styles of rooms and suites, each with high-speed internet access and flat screen plasma TV. Deluxe rooms offer guests a choice of one king-sized bed or two queen-sized beds, with marble rainfall showers in the bathroom and views of the lush forest surrounding the resort. The Director Suite features a king-sized bed and walk-in closet, a master bath with Jacuzzi tub, and a separate sitting area to enjoy a movie with room service. Floor-to-ceiling windows in the sitting area offer panoramic views in the king-sized Producer Suite. The Fox Tower offers eight unique dining venues fitting for any occasion and taste. Alta Strada is the hotel’s excellent Italian restaurant for everything from pizza to pasta and antipasto plates, with a selection of Italian wines on hand as well. For a quick, hearty meal, The Grill Shack offers burgers, and Nathan’s Famous Hot Dogs piled high with toppings and a side of fries or kettle chips. Adventurous eaters will find gourmet Asian cuisine in an upscale setting at Red Lantern, featuring an open kitchen and lounge area. Junior’s offers a taste of Brooklyn with steak burgers, deli sandwiches, and New York-style cheesecake. Einstein Bros Bagels is a great spot for a quick breakfast or lunch, with salads, sandwiches, and smoothies. Guests can also find food court favorites like Boar’s Head Deli, Sbarro and Phillip’s Seafood. The hotel also offers room service for breakfast, lunch, dinner, and snacks in between. G Spa & Salon at The Fox Tower offers 21,000 square feet of indoor and outdoor relaxation. Visitors can choose from a wide selection of massages, facials, body treatments and salon services, including treatments drawing from ancient Native American rituals. The facility features a fitness center, indoor pool, and whirlpool, as well as a sauna, steam room, waterfall whirlpool, and outdoor sun decks. For guests 21 and over, The Fox Tower offers nonstop entertainment day and night. The Fox Tower Pool spans 5,500 square feet, featuring eight private cabanas with flat-screen TVs and indoor and outdoor seating. During the summer, the pool hosts Liquid Sundays, the area’s only outdoor Vegas-style pool party, with bottle service, live entertainment, and celebrity meet-and-greet and photo opportunities. Nightlife at The Fox Tower is just as exciting. Centrale Fox Tower is the hotel’s casino bar, with slot machines, live action table games, specialty cocktails and live entertainment six days a week. Located off the hotel lobby, The Fox Tower Casino is filled with hundreds of slot machines and gaming tables. Some of the best shopping at Foxwoods Resort Casino is very close to The Fox Tower. Tanger Outlets at Foxwoods offers world-class shopping with premium brands like Michael Kors, Nike, Calvin Klein, H&M and many more. Located inside the hotel, Carina is an upscale boutique for designer women’s clothing, shoes, and accessories. For guests with a sweet tooth, Lick offers a wide variety of classic and new candy creations and souvenirs. 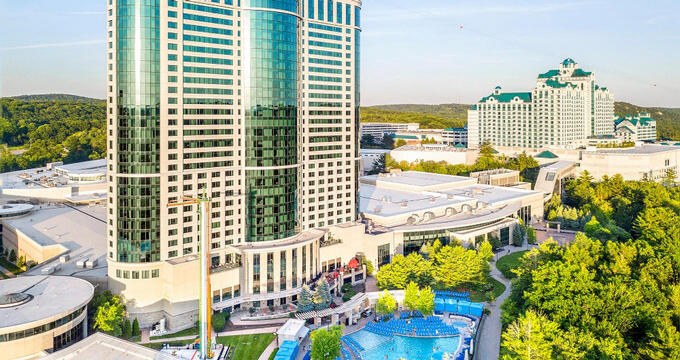 Located between The Fox Tower and Grand Pequot Tower, The Grand Theater hosts a variety of entertainment acts, from musicians to comedians and TV personalities. Thrill-seekers can also find unforgettable adventures at The Fox Tower. The High Flyer Zipline takes guests from the top of The Fox Tower across a 3,750-foot-long line to the Mashantucket Pequot Museum & Research Center. The ride reaches speeds of up to 60 miles per hour, with expansive views of the resort and forested Mashantucket hills. Just outside the hotel lobby, Sky Drop takes riders up ten stories for a rapid freefall, while Sky Launch turns riders into human catapults with a slingshot bungee ride.